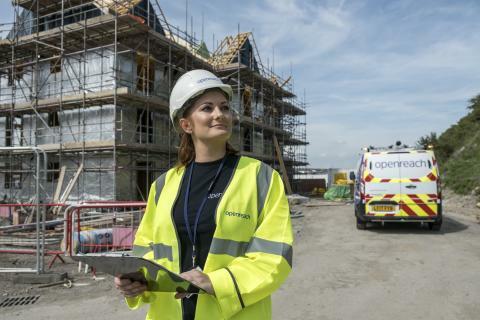 Around 3,500 new homes and flats across major new housing developments in Oxfordshire will be able to get some of the fastest broadband speeds in the UK following a deal between Openreach and housing developers. Openreach, the business responsible for Britain’s largest phone and broadband network, is answering a call to build fibre-to-the-premises (FTTP) technology capable of ultrafast speeds up to one Gigabit per second (Gbps) for properties on sites in locations including Banbury, Bicester, Carterton, Didcot, Grove, Oxford and Wantage. As well as the schemes in Oxfordshire, Openreach has made FTTP technology available to more than 2,000 new developments nationwide, covering more than a quarter of a million premises, since the partnership launched last year. “It reflects our commitment to ensuring that Oxfordshire and the UK has a first-class network, capable of delivering the latest communication services for households, businesses and other organisations. We work on behalf of more than 580 communications providers like SKY, TalkTalk, Vodafone, and BT, and our fibre broadband network is the biggest in the UK, passing more than 26.5 million premises. We’re also the platform for Britain’s thriving digital economy, which is the largest in the G20. We’re working hard to give people the speeds they need to run and enjoy their daily lives. Over the last decade, we’ve invested more than £11 billion into our network and we now manage more than 158 million kilometres of cable stretching from Scotland to Cornwall, from Wales to the east coast. And we’re continuing to take that network further - making superfast broadband speeds available to thousands more homes and businesses every week.